The Lucy’s Legacy exhibit was reviewed in early February by a representative of the Seattle-based Discovery Institute, which promotes Creationism and Intelligent Design. In the following paragraphs, I would like to add my observations to the statements found in this review. Let me start with a few general remarks. First, a favorite approach by Creationists is to cast doubt on the subject of evolution, particularly human evolution and to drive a wedge between faith and science. This policy, known as the Wedge Document, is publicly acknowledged by the Discovery Institute as being theirs. Second, a favorite approach of Creationist writers is to represent issues in stark black and white terms. The 2000-word document is sprinkled with terms that drive the message home: the study of human evolution fails as a belief system; the evidence is scarce and the interpretations fast and loose and not widely accepted. Moreover, some of the evidence is misrepresented. The writer of the document stated that there is a “paucity of actual hard evidence for human evolution.” An interesting statement, but one which considering the presence of an actual fossilized hominin fossil, fails itself to carry any water. What harder evidence can one want, but for an authentic fossil, I wonder. The same author also quotes a statement that “unless more fossils are recovered (…) there is likely to be a continuing debate on Lucy’s posture…” Two thoughts come to mind here. It is always good to have more fossil evidence. In fact, for years paleoanthropologists have continued to find fossils every year. Our database of fossilized early humans continues to grow, courtesy of an ongoing scientific effort. This growing database has led to the formulation of answers to old questions while at the same time giving rise to new questions which we need to answer. That is the essence of scientific research; it is a never ending quest for better insights in what we can observe. These statements, using the terms “paucity” and “until more fossils are recovered,” are misleading. One wonders if the author knows that the remains of 300 Australopithecus afarensis individuals are known to the scientific community, making Lucy and her kind the best known of all of early human ancestors. Another lament found in the document is the “incompleteness” of her (i.e. Lucy’s) skeleton.” The author continues “only 40% was found” and “very little useful material from Lucy’s skull was recovered.” I suppose one could say that everything is in the eye of the beholder. Of course, 50% or more would have been even better. 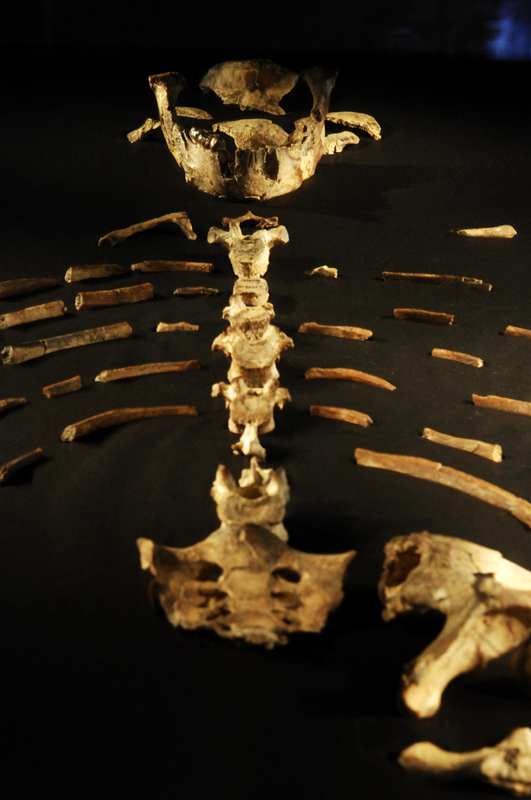 However, another way of referring to Lucy and the preservation of her skeleton is that it is amazing that so much was preserved, considering she died more than 3 million years ago. Factually incorrect is a statement that “Lucy still represents the most complete known hominid skeleton to date.” There are currently older and better preserved fossils, including some of the same species as Lucy. Baby Selam for example, is much better preserved. 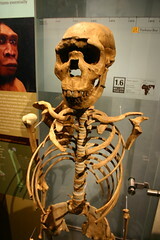 More recent than Lucy, but better preserved is an early hominid known as Turkana Boy. 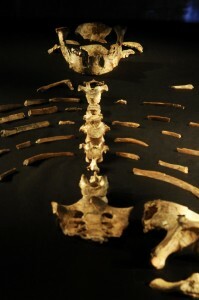 Lucy is still the earliest known and most complete adult Australopithecus afarensis. Things were different in 1974, when scientists could say that she was the oldest known and best preserved skeleton of a distant human ancestor. The fact that this statement now has to be qualified to reflect more recent discoveries is a testimony to the dogged work carried out by teams of paleoanthropologists in Africa. It is also an insight that ought to have been included in the Discovery Institute document, as I am sure that this is something they are aware of. We also get to read that Lucy’s bones were found scattered across a hillside, a vague reference to an old creationist claim that Lucy’s bones do not all belong to the same individual. The fact that this claim has been debunked does not stop creationists from repeating it. The author – it seems – seems to prefer that Lucy’s bones would have been found together as a contiguous skeleton. Aside from the fact that intentional burial did not exist in Lucy’s time and that she did die more than 3 million years ago, it would have been a miracle (pardon the pun) if she had been preserved completely intact and as a contiguous skeleton. One should not, however, raise the reader’s hopes by presenting this a something that should have happened. I would like to end by referring the author of the Discovery Institute piece as well as all the readers to this latest development: Lucy was scanned at the University of Texas, Austin campus, after the exhibit in Houston had ended. I have no doubt that scientists will be pouring over this new dataset and that this effort will result in improving our understanding of who we are and where we came from. Loyalty to a cause is admirable; having the ability to see countless shades of grey instead of only black and white is even more desirable. I don’t believe that Lucky is the mother of all. In the article it said that “only 40% was found” and “very little useful material from Lucy’s skull was recovered”. That mean over 60% of head is missing which is the most important. I can’t agree with a bold headline like this with so much lacking evidence. Thanks for your reaction to this blog entry. I am not asking that you believe that Lucy is the mother of all. She was not. The text panels in the exhibit did not identify her as such either. What we can say is that Lucy, being an upright walking primate, shared that particular trait with us. However, compared to us, her brains were much smaller, and we do not have evidence that Lucy and her relatives ever used tools, as we do. Also, it is not quite true that over 60% of the head is missing; it is probably more than that. We have 40% of her entire body preserved, or, as you would prefer stating, 60% is missing. Missing in Lucy’s case that is. In my blog I mentioned that we know of more than just Lucy to study her species. 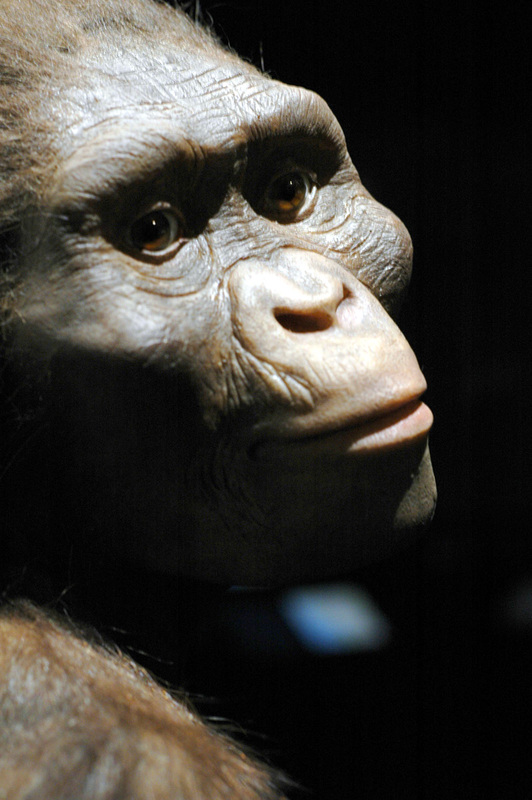 Scientists have acces to more than just one Australopithecus. In fact, we have found more than 300 individual Australopithecines like Lucy. That is in the same ball park as the number of individual Neandertalers we know, and those were around much more recently. That is what makes this story so fascinating: we have incredible time depth (more than 3 million years) and a substantial database to work from (more than 300 individuals). Just to put things in perspective, about 35 years ago, when Lucy was found that number was probably in the single digits. Ongoing field work continues to yield more evidence of ancient human ancestors. This brings me back to your reference to Lucy as the mother of all. What we can say about Lucy, in the context of additional fossils, some older and some more recent, is that she was a distant ancestor of ours. Perhaps a great-great-great aunt, if you want, but somehow related to us. The proof is in the ever growing set of bones unearthed in Africa and in our growing understanding of what ( or rather who) these bones represent. I accept these hard facts (as fossilized bones tend to be…), I enjoy reading the initial reports of a discovery, followed by scientific descriptions and the subsequent discussions among scientists about what a particular find actually represents. This back and forth, sometimes extending over a period of several years, focusses everyone’s mind and keeps all of the participants honest. Eventually, agreement emerges as to where in a chronological and evolutionary sequence a fossil belongs. The dance starts again when another fossil is found. Such ongoing discussion and questioning of these findings by the scientists themselves is a prime example of how the concept of evolution is being tested and challenged on a daily basis. We do not ask that you believe in this; we do ask that you consider the evidence and then either accept the thinking behind it, or else challenge it yourself with an alternative explanation. A scientist is required to do the same; outright stating one does not believe something without coming up with an alternative solution to the problem would lead us nowhere. I appreciate your input and I hope that I have been able to convey the excitement involved in reading through some of the books and articles related to human evolution. In the end these writings help me answer the question of who we are and where we came from. Since you read the initial blog, I think that these are questions that interest you as well. I don’t believe in the wording but for the sake of response I do believe Lucy is “the mother of all”. While I do believe that science is Man’s newest attempt to explain the world around us it backs up its clams with experimentation and evidence. It also recognizes that while many beliefs may be right it goes with the most likely one. Good Science is also self-correcting. While the theory of evolution has holes in it, it explains so much. It also explains what has happened to many other species and what is still happening. Even though only 40% of Lucy’s body was found, people are able to tell which bones belong to which animal through carbon testing. Finding 40% of a three million year old body is very impressive, not to mention the various other specimens found. Also with the possibility of broken bones and limes being carried off by scavengers it is a miracle 40% was found. In fact one of the most exemplary specimens of the Eugene Dubois was found in many crushed up pieces and placed back together in a lab. I don’t always agree with science, but I do have faith in it. The article itself implies that Lucy is not the mother of all. Near the end it states that “there are older, but better preserved hominids than Lucy…”. Using “Baby Salem” as the example of that statement. So although the fossils are better preserved, the key detail about it is that the fossils are older than Lucy; meaning that it came before Lucy. If, this is true, than Lucy is not the mother of all species, because something came before her. Lucy fossils might be the most significant because scientists have discovered so much about the development of bones and life over the milleniums, but Lucy is not the beginning. I agree. Human life defiantly evolved in Africa. If humans all evolved in different places they would evolve in such different ways that peoples of different regions wouldn’t be able to have children together or have sterile children like mules. While humans may have developed different features according to their environments such as the tall dark people of East Africa, or the portly pale people of northern Europe, if they evolved in individual places of origin we would look nothing alike and become so specialized we wouldn’t still contain body parts we have no use for. Wow. How can someone be so obsessed with glory and power they would stand in the way so scientific progress? I can see why Mr. Leakey wants’ to be credited with the historic findings and continue on the family legacy but to through a man in jail and make up dirty lies to discredit someone’s name because of jealousy is unjustifiable. That is amazing. To find such a well preserved human evolution is nothing short of an instant history maker. This can unlock some serious holes that Lucy leaves behind including the debate about her skull. The climbing abilities are also very interesting. Is this a lingering evolutionary adaptation form living in the forest or did they still climb in the savanna or did they ever live in the savanna. This brings up many questions and answers many at the same time. I am impressed. Despite the unprecedented find I highly doubt the majority of American citizens will think of anything other than Lucy when presented with a question of ‘Australopithecus afarensis’ skeletons. It’s really hard to bring new finding to popular culture that isn’t well educated on the subject. Previous Post Caves are the Coolest!